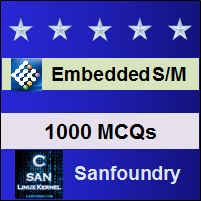 This set of Embedded Systems Multiple Choice Questions & Answers (MCQs) focuses on “Memory Management”. 1. Which of the following have a 16 Mbytes addressed range? Explanation: The M68000 family has a 16 Mbyte addressing range. The PowerPC family has a larger 4 Gbyte range and the DSP56000 has a 128-kilo word address space. 2. Which of the following can destroy the accuracy in the algorithms? Explanation: The delays occurring in the memory management unit can destroy the accuracy in the algorithms and in order to avoid this, the linear addressing range should be increased. 3. How many numbers of ways are possible for allocating the memory to the modular blocks? Explanation: Most of the systems have a multitasking operating system in which the software consists of modular blocks of codes which run under the control of the operating system. There are three ways for allocating memory to these blocks. The first way distributes the block in a predefined way. The second way for allocating memory includes relocation or position independency in the software and the other way of allocating memory to the block is the address translation in which the logical address is translated to the physical address. 4. Which of the following is replaced with the absolute addressing mode? Explanation: The memory allocation of the modular blocks can be done by the writing the software program in relocatable or position independent manner which can execute anywhere in the memory map, but relocatable code must have the same address between its data and code segments. This is used to avoid the use of absolute addressing modes which is replaced by the relative addressing modes. 5. What is the main purpose of the memory management unit? Explanation: The memory management unit handles with physical addresses. Therefore, the virtual or the logical address is first translated to the physical address. 6. Which of the following provides stability to the multitasking system? Explanation: The memory partitioning provides stability to the multitasking system so that the errors within one task will not corrupt the other tasks. 7. Which of the following is used by the M68000 family? Explanation: The M68000 uses memory partitioning by the use of function code or by the combination of superscalar signals and the Harvard architecture. 8. What can be done for the fine grain protection of the processor? Explanation: The finer grain protection of memory management is achieved by the addition of extra description bit to an address to declare its status. The memory management unit can detect an error if the task attempts to access memory that has not been allocated to it or a certain kind of mismatch occurs. 9. Which of the following technique is used by the UNIX operating system? Explanation: In the workstation and in the UNIX operating system virtual memory technique is frequently used in which the main memory is divided into different segments and pages. These pages will have a virtual address which can increase the address spacing. 10. Which of the following consist two lines of legs on both sides of a plastic or ceramic body? Explanation: The dual-in-line package consists of two lines of legs on both sides of the plastic or ceramic. Most commonly used are BIOS EPROMs, DRAM and SRAM. 11. Which package has high memory speed and change in the supply? Explanation: DIMM is a special version of SIMM which is 168-bits wider bus and looks similar to a larger SIMM. The wider bus increases the memory speed and change in supply voltage. 12. Which is a subassembly package? Explanation: The SIMM is basically a subassembly, not a package. It is a small board which possesses finger connection on the bottom and sufficient memory on the board in order to make up the required configuration. 13. What is the required voltage of DIMM? Explanation: For increasing the speed and reducing the power consumption, it is necessary to reduce the power supply. Today’s CPUs and memories have 3.3V supply or even lower instead of the signal level from 0 to 5V. DIMMS are described by its voltage, speed, and memory type respectively as 3.3V 133MHz SDRAM DIMM. 14. Which memory package has a single row of pins? Explanation: The Single-in-line package is the same as that of SIMM, in which the finger connections are replaced by a single row of pins. SIP took the popularity of SIMM but nowadays it is rarely seen. 15. What is the access time of MCM51000AP10? Explanation: The access time of memory is defined as the maximum time taken by the chip to read/write data and it is very important to match the access time to the design. For example, MCM51000AP10 have 100ns access time for the memory.